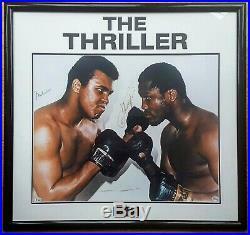 A dual signed photo of Muhammad Ali and Joe Frazier, professionally matted and framed to a total size of 25.5 x 24 inches. The 16 x 20 photograph has been signed by both fighters in sharpie pen. 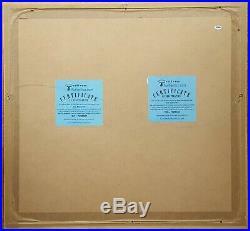 Very good condition - the signatures are a touch light and the frame has a few scratches. Both autographs have been authenticated by Online Authentics. 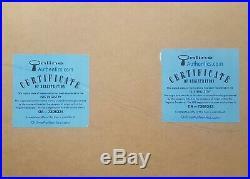 The certificates of authenticity have been affixed to the back of the frame and there's matching stickers on the photo itself. 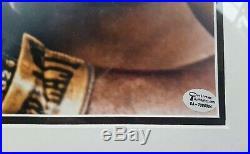 The Ali autograph is certification number OA-7306343 and the Frazier is OA-7306324. These can be verified on the Online Authentics website. Please check out our other boxing memorabilia! The item "MUHAMMAD ALI & JOE FRAZIER dual signed 16 x 20 photo (framed) Online Authentics" is in sale since Tuesday, March 19, 2019.